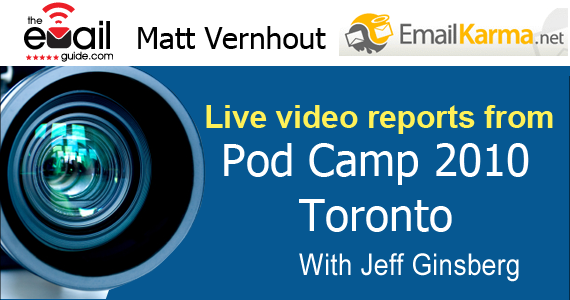 Jeff Ginsberg talks with Matt Vernhout, Director of Deliverability and ISP Relations, Thindata 1 to 1 at Pod Camp in Toronto. Matt is an active blogger on everything from eMail marketing to video gaming. You can find him blogging at EmailKarma.net and of course, right here with us at The eMail Guide. He’s also very active in social and moderates The Email Marketers Club, an online community which boasts 3,700 eMail marketing professionals. In the interview, Matt discusses some issues facing people using eMail marketing such as pushing the envelope of permission – you can’t transfer permission from one organization to another. Permission, as Matt points out, is granted directly to you and it’s not something you can purchase with a list. In fact, list rental done right means simply sending/placing an ad in someone else’s eMail list/campaign message in order to drive subscribers to your list.